Can I help you find something? asks the bakery clerk. Please, I say. I'm in Kroger's bakery section leafing through their cake decoration book. Flipping past the pages of Disney princesses, Sponge Bobs and Spiderman cake photos. With the exception of Blue's Clues, there's not anything much dog related. And for a matriculation party? I'm not sure this young girl would even recognize the word. So, let's keep it simple. I'd like to get something with a dog theme, but with dignity, you know? I say. Nothing cartoonish or silly. I want to tell her the dog is going to college. I decide to keep this little factoid inside my head for now. But it's obvious I have her stumped. And the sample book just proves to me that the category of "dogs matriculating into advanced training at service dog college" is a unique niche. Of course I knew that already. Even after raising two other CCI puppies, this is the first time I've ordered a cake for a matriculation party. I'm then struck with inspiration. Oh I know! A Face Cake! That will be perfect, I think. I'll print out a nice photo of Yaxley and they can make it into an edible image on the cake. Blue and yellow embellishments will keep it all CCI-like. Yep, that'll do quite nicely. A lovely job, I think. Thanks bakery people! The icing matches the CCI colors. And Yax's name is spelled right. The four-dot embellishments are paw prints. I think. We'd sent out invitations at work the week before. 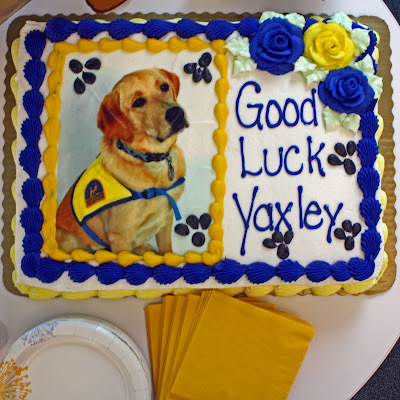 With the promise of dog hugs and free cake, we're expecting a lot of folk to stop by to give their best wishes to Yaxley. It was a BYOD open house celebration. Bring Your Own Dog. And some of Yaxley's best friends showed up - Scarlet, Natas, Micron and P&G's VP of Canine Communications, Pawl Griffin. Not sure why Yaxley looks so down in this photo. Perhaps missing his crush, Jolie, who couldn't make the celebration. Reminds me a bit of It's My Party and I'll Cry If I Want To. Which is now an ear worm, stuck in an endless loop in my head. You too? Yeah, sorry 'bout that. I took six shots of this group. Pawl Griffin was moving in every one, the stinker. They all wanted to do the usual dog party games, like I Can Name That Smell in One Sniff and Who Can Eat a Dog Biscuit the Fastest. We had to set boundaries, though, and remind them the game Today is Hump Day is not appropriate in the office environment. Ok people, now here's the downside to a face cake. There's some weird neuron clicking in our noggins that rejects the idea of actually consuming something that's looking back at you. My sister, the selective vegetarian, won't eat anything that has a face. Except shrimp, go figure. So, that means she won't eat anything that has a face, unless it tastes good deep fried in batter. Which by the way, I think shrimp look like sea bugs, with beady eyes and all those skittery legs. And crabs? Ocean spiders, they are. Go ahead, think about it a second. I have a thing about not consuming anything that looks like a bug. Unless it tastes good deep fried. That's how we roll in my family. So anyway, after all is said and eaten, Yaxley's image remains. Those expressive eyes looking up at you from all that cake goodness. Everyone who meets Yaxley mentions those soft, brown eyes. They are the windows to his soul, as they say. The image of Yax's noggin is pretty much the exact size of one serving. You guys left Yaxley's face, I say. It's ok to take that piece, it's just cake you know. We saved that piece for you, they say. Um, ok. I said. Thanks? Of course, there's no way I could take a fork to it either. I mean, just look at it. He's making eye contact and everything. Don't eat me, Bro, those eyes implore us. So, do you think he's gonna make it? This is it, Yaxley [sniff]. Good bye, big guy. What are you gonna do now? Get another puppy? Micron's going to really miss him when he's gone, isn't he? Just one last [sob!] hug. I started to realize it was sounding like we needed to get a priest in here for Last Rites or something. Holy cow, time to ground myself. This isn't the end of Yaxley. Instead, we're sending him off to his destiny. 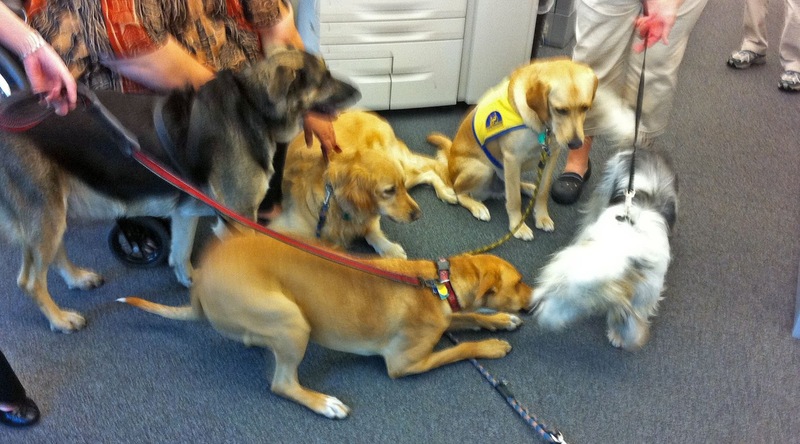 Advanced Training, Dog College or boot camp - whatever we want to call it. He has more to learn, things to do. In a perfect world, he will graduate in six months as a service dog. But it's not a perfect world, right? I don't know what's going to happen over these next few months, nobody does. It's not going to hold me back from sending positive thoughts his way, though. Yaxley is going to rock somebody's world. On our final day with Yaxley in our home, it's a fine time to thank P&G Pet Care and all my co-workers for being so supportive of the CCI puppy raising program. Honest to God, we couldn't have done this without you. Especially Mary Ann, Amy and Jeff during the early puppy weeks while we were preparing to move to the new office. And Heather for being there as I found my groove with work/life balance. 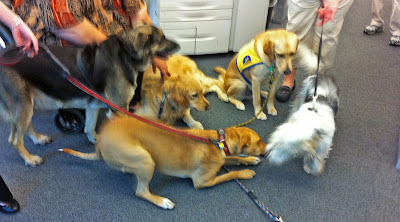 Thanks to Laurie for those therapeutic doggie massages. And Russ for tormenting the snot out of the pup and providing those opportunities to encourage good behavior. Kristie, Andrea, Tracy, Nina and everyone who offered up their own dogs as suitable playmates for Yaxley. Thanks to Mere, who understands it's ok to goof around with Micron, but Yaxley is serious business. Tomorrow is the big day, people. While I haven't seen the list yet, I would guess there will be about two dozen of us turning these amazing pups over to CCI in our region. The same in the other regions, as well. 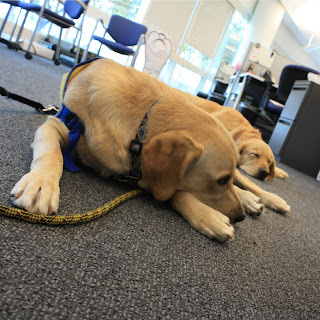 Keep all us puppy raisers in your thoughts, won't you? We know we're doing something pretty darn cool and amazing here. We want to do this thing. But we're gonna cry anyway. Sad to see Yax moving on, we'll miss his fun escapades! The Kansas City Chapter is sending 2 of our own; Orella and Clark. Good luck to all the "newbs" at NC. I know, it seems like we still have more stories to tell. We'll put up some shots from North Central's grad ceremony. 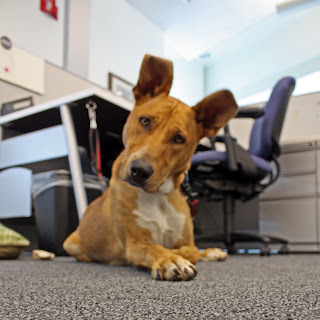 Yax will be meeting back up with his littermate, Yoda, so we should get some cute stuff then. Thanks for the good luck wishes. Awww, you have me crying already! Good luck to Yaxley! I know that whatever you choose to do that you'll be A-mazing!!! Thanks for the best wishes, Hannah. Yaxley's already changed my life and has touched so many others. And he's just getting started. This yellow dog has so much more to do, I think. Congrats on raising an awesome dog! Yaxley is going to make such an incredible difference in someone's life. Best wishes to him (and to you!) during the next steps. We'll keep things updated here. CCI will give us monthly updates on his progress and I'll share with everyone. Thanks for the best wishes, Steph! Mary, we sure do miss you and Teddy. Thanks so much for dropping by here and letting us keep up with your own adventures on FB. Keep your fingers crossed for great stuff from the yeller dog. Hopefully you'll be able to brag and tell people "you knew him when." I feel pretty good with saying that we did the best we could to get him ready for advanced training. But I could also say that there's more we could do and just another couples of months would be ok with us. But it's time and I know it. Thanks for the good luck wishes! Awww... I'm crying already and I just met Yaxley! 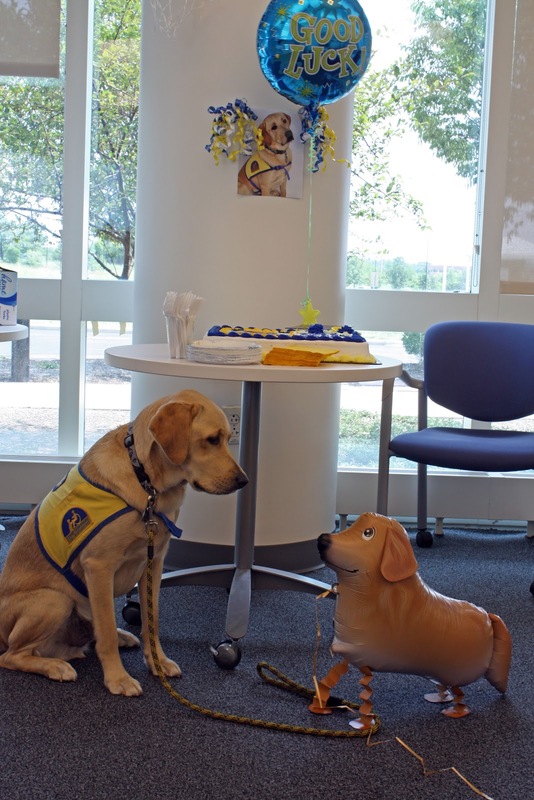 You gave Yaxley the foundation that he needed to make an awesome service dog for someone. Congrats to the both of you! Thanks Leslie, I really appreciate your kind thoughts. And an extra thanks for dropping a comment so I could discover your amazing blog about Nettie. 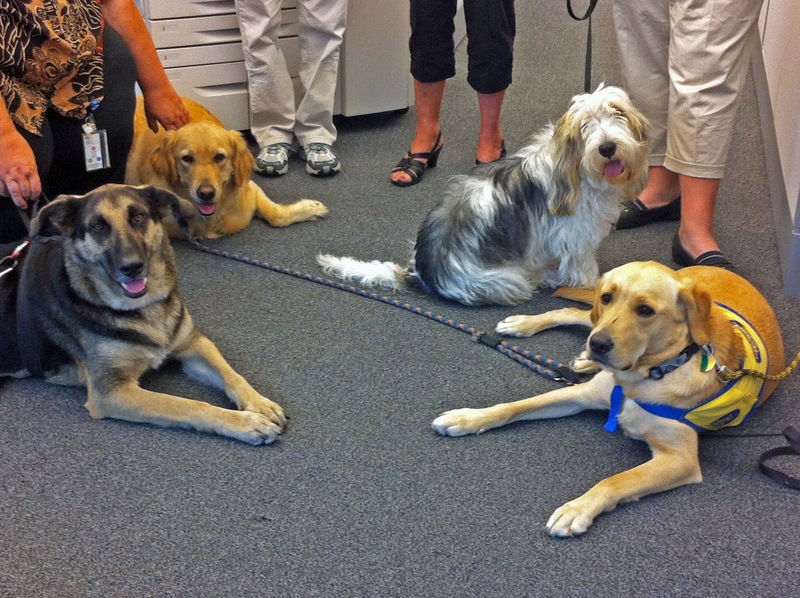 I've got you in our blog roll now (service dogs, hearing dogs . . .) and hopefully we can net you a couple more readers to fall in love with your stories. Like the baby bird one. I *love* that one. I am the one to be thanking you! Our family is one of the grateful recipients of the love, hard work and dedication that you give these amazing CCI puppies. I am in constant awe of puppy raisers!